SkyTrackers™ provides its user the capability to determine remotely the real location and activity of a vehicle through the use of GPS based Automatic Vehicle Location technology. Our internet web based page (www.skytrackit.com) provides access to real time information on detailed digital and Google maps. This information is updated as frequently as every 2 seconds. Among its many advantages, the SkyTrackers™ allows the user to set speed limits, create routes, geofences, alarms, alerts, etc. 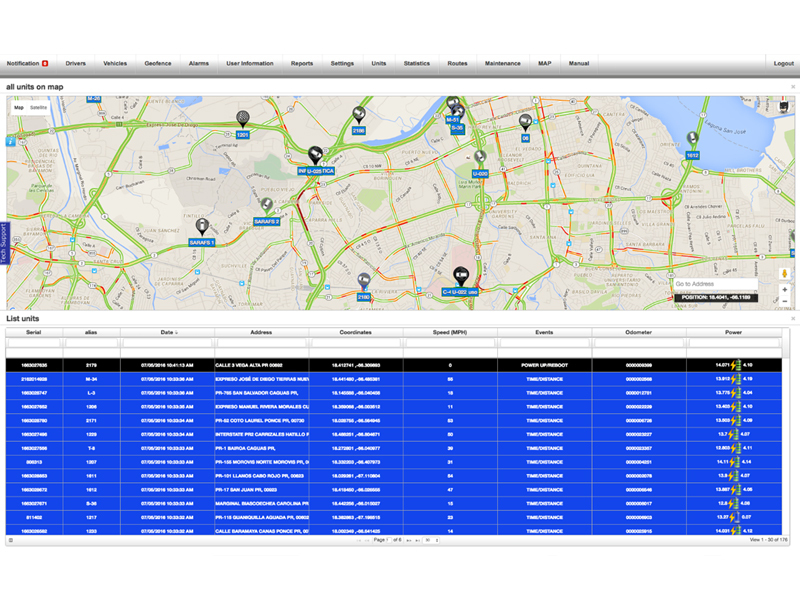 SkyTrackers™ is an important complement to other systems like the Computer Aided Dispatch and the SkyCall. Internet Access to www.skytrackit.com where you will locate your vehicle on detailed digital and/or Google maps and obtain real time information about its activity, including position, speed, date, time, stops, ignition on/off, route travelled, etc. Apps available in different mobile platform (IOS and Android). Total control/monitoring for location of assets like vehicles, construction equipment, electric generators, trailers, boats, motorcycles, etc. Improves employee productivity by optimizing the use of the fleet and working hours, hence eliminating unnecessary overtime. Creates more efficient routes. Detects and eliminates unauthorized trips or “sideline” jobs by employees. Promotes a responsible use of the vehicle by the driver. Reduces costs; increases profits. Reduces fuel consumption, travel time, maintenance costs, vehicle repairs and insurance costs (by minimizing accidents and over speed tickets). Security of employee, vehicle and cargo/merchandise. Improves customer service and increases client retention. Stolen vehicles recovery, thus reducing loss for that concept. Vehicle activity reports that help control fuels costs by minimizing over speeds, improving routes, eliminating the use of vehicle for tasks not related to the job and ensuring that vehicles do not trespass their designated area. Skytec’s applications are the only ones in the market that allow for customized integrations with other applications that require specific development, thanks to the company’s team of specialized engineers. Creation of Geo-Fences (areas of operation), reference/Geo Points and reports (“Geo-Fence Coverage Reports”). Sensors – temperature, doors, etc. Vehicle Use Statistics: No operation time; Operation time (includes Movement time and Idle time. Driver License Renewal Alert in the Drivers module.